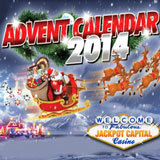 Jackpot Capital Casino has some adult treats for hidden behind the doors of its 2014 Advent Calendar. Every day until Christmas, we can uncover iPhones and iPads, no-deposit casino bonuses or free spins on holiday classics like Santastic, Return of Rudolph and Naughty or Nice. Behind one door there’s an iPad Air and there are 10 iPad Minis behind another. Other doors hide cash prizes or up to 100% casino bonuses and on Christmas Day there will be not one but 25 $100 cash prizes. After Christmas there will be a series of bonuses culminating in a $25 no-deposit bonus. In a New Years Day draw, 25 players will win an iPhone 6 or Samsung Galaxy S5 4G. To check today's prize and coupon codes for more post-Christmas casino bonuses, see http://promotions.jackpotcapital.eu/adventcalendar.